Heat rash appears after your body has been exposed to high heat or fever. This common form of rash can be easily treated and avoided with proper care. This rash is caused by the sweat ducts but isn't the same as sweat rash. Unlike chafing, which is simple friction, heat rash (also known as "prickly" heat or by the medical term miliaria) is caused by excess perspiration that does not reach the surface of the skin. Small bumps then form, which causes raised, irritated skin. When the bumps burst, sweat is released, and a burning or prickly feeling occurs. 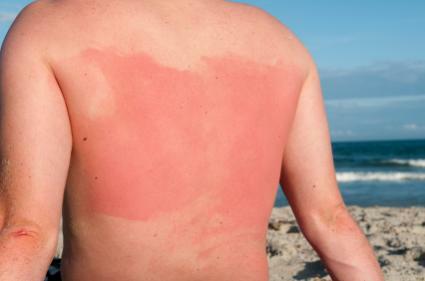 The rash usually develops during hot, humid weather. However, it is possible to get a rash in the winter, due to overdressing. Those most likely to get this condition include newborns in incubators, infants, active people, overweight people, and bedridden people. It can occur in anyone, so taking proper precautions to avoid getting prickly heat is advisable. The rash and the intensity of the condition can be broken into three classifications, according to the Mayo Clinic. These three types can occur at any time on anyone regardless of any prior incidents. If this is your first bout of this rash, seek medical treatment promptly to diagnose and to classify your condition. With proper care and diagnosis, heat rash and the uncomfortable itch can be treated. Miliaria crystalline is the mildest form. Often the only symptom present in miliaria crystalline is small red bumps on the surface of the skin similar to blisters rather than an obvious rash. This condition causes mild, if any, discomfort. When a case of miliaria crystalline escalates to the next level, it's diagnosed as miliaria rubra. Heat rash that seeps sweat into the deeper layers of the epidermis cause larger blisters and a painful red rash. Just as this rash appears quickly, it also disappears as soon as the trapped sweat has a chance to expel and requires no further treatment. Known as the most extreme form, miliaria profunda is flesh colored and extremely itchy and painful, and some liken the rash to the sensation of "wild fire." Although much more widespread and prickly, even the most extensive form clears up on its own, normally within several hours of the initial outbreak. To treat this extreme form, remove layers of clothing and allow the skin the opportunity to breathe and air out. Once the sweat glands expel the trapped moisture, the rash quickly heals itself. Cool off in front of the air conditioner or a fan. Take a cool shower or bath, and let the skin air dry. Avoid most lotions or creams. After you have cooled off, you may try using a calamine lotion or 1 percent hydrocortisone cream to relieve itching. Speak to a doctor before giving babies or young children any over-the-counter drugs. Most babies can be relieved by a cool bath and thorough drying. Switching to cloth diapers may help their skin release excess sweat more proficiently. However, if a baby's rash does not go away, do call the doctor. Sometimes this can be a symptom of something else. In extreme cases, prickly heat can cause problems other than discomfort and nasty rashes. In these instances, it can hinder the body's own heat regulation system. This can lead to fever, heat exhaustion or, in rare cases, even death. Consult a physician if your rash does not clear in a few days. If you or the person with the rash are also experiencing symptoms of heat exhaustion such as dizziness, nausea, vomiting and excessive perspiration that do not clear up within 30 minutes of home-care measures, however, contact a doctor as heat exhaustion can lead to heat stroke. Wear lightweight clothing that allows air to circulate and keep the skin cool. Avoid synthetic fibers during the hotter months. Although heat rash cannot be completely prevented, it is always a good idea to take any precautions possible against this uncomfortable condition. For example, in the case of children who are most at risk due to immature sweat glands, air out damp, moist environments such as the areas beneath the creases of elbows, legs, the scrotum, and between the thighs. Keeping these areas well ventilated prevents the sweat from getting trapped. This is not a rash that is transferred from person to person, so avoiding contact with others is unnecessary. Stay indoors with the air conditioning on during hot, humid weather and keep well-hydrated with plenty of fluids. Avoid excessive sweating due to extreme temperatures by scheduling outdoor activities earlier in the day and remember to dress appropriately during periods of extreme heat. Affected areas should be monitored for a future infection. Because the bumps that open in these warm, moist areas can create a breeding ground for fungus or bacteria, another infection can occur after the rash has cleared. If this happens, consult a doctor. Most cases of heat rash clear up quickly, while others may require anti-itch treatments such as calamine lotion or cooling menthol ointments to soothe the skin and alleviate itching. Know how to prevent, treat, and when to seek medical help for this type of rash to stay comfortable and safe.